A really eye-catching tree. Vilmorin Rowan (sorbus vilmorinii) produces a dramatic display of berries that quickly change from crimson to white during autumn and last well in winter. Dainty feathery leaves, which consist of a very many dark-green leaflets cover this tree and change to a deep red colour in autumn. This tree will reach a final height of 4m (13ft), after 20 years, so is an ideal tree for a small intimate garden. 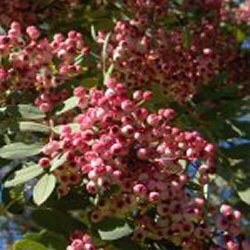 Vilmorin Rowan is supplied at a height of 1.2-1.80m in a 5-12L container, which means that the tree has an already established root system and therefore this tree can be planted any time of the year and with better results than either bare-root or rootballed trees.